It's day we honor not only George Washington and Abraham Lincoln but all the men (no women yet!) who have served as President of the United States. "The federal holiday honoring Washington was originally implemented by an Act of Congress in 1879 for government offices in Washington and expanded in 1885 to include all federal offices," according to Wikipedia. "As the first federal holiday to honor an American president, the holiday was celebrated on Washington's birthday under the Gregorian calendar, Feb. 22. On Jan. 1, 1971, the federal holiday was shifted to the third Monday in February by the Uniform Monday Holiday Act. This places it between February 15 and 21, which makes 'Washington's Birthday' something of a misnomer, since it never occurs on Washington's actual birthday, Feb. 22." "A rough analog of this phenomenon can be seen in Commonwealth realms, where the reigning monarch's official birthday is celebrated without regard to their actual date of birth." 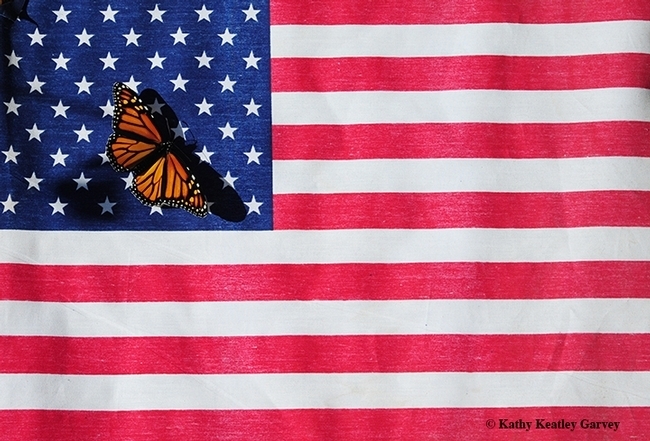 And speaking of monarchs and Presidents' Day, it's a good time to post a monarch on the American flag. Danaus plexippus reigns supreme in the world of butterflies, in that it's arguably the most recognized butterfly. The embattled monarch--some folks want to see it listed as threatened or endangered--will be the subject of a session hosted by the Environmental Defense Fund on Feb. 28 at the University of California, Davis. It's by invitation only. But one of the speakers is Art Shapiro, UC Davis distinguished professor of evolution and ecology. Shapiro, who has monitored the entire butterfly faunas (including monarchs) at 10 locations along I-80 coordinator for more than four decades, just published a commentary in the Davis Enterprise headlined "So the Monarch Is Endangered--Now What?" He began with "So the monarch butterfly is in trouble and various folks, including the editorial board of the Sacramento Bee, want California or the United States, or both, to declare it endangered or at least threatened (Bee editorial Feb. 5). Great, then what? "The fact is, nobody can answer that question competently." "There is no disputing the facts: Monarch butterfly populations in California have dropped catastrophically," he wrote. "Based on counts of adults overwintering along the coast, numbers have dropped from some 4.5 million in the 1980s to a mere 28,429 this year. At one site, Bolinas, numbers dropped 90 percent in one year from 12,360 in 2017 to 1,256 this year." "But the decline has not been linear or monotonic, and it is very poorly understood." He noted: "Conservation organizations are promoting lists of things private citizens and organizations can do to help “save the monarch.” The most-often-repeated one is to plant milkweed, its larval host plant. But there is absolutely no evidence that there is any milkweed shortage in California, let alone that such a shortage is driving monarch declines." Shapiro went on to write that "there are huge holes in our knowledge of basic monarch biology, and those translate into our inability to say why monarchs are in decline." Shapiro noted in his commentary that "We have been stuck with using the winter censuses, which are easy to generate, as our measure of population size. But the winter numbers are the sum of everything that happened during the year, which is hidden from our view except very locally. One can do statistical analyses with them and they will give you some kind of an answer, but will it tell us anything used in interpreting reality?" "The point of giving species protection under Endangered Species legislation is to provide a legal umbrella to encourage actions that will promote species recovery. Most endangered species have discrete populations and their critical habitat and resources can thus be protected. The monarch is different. There is no point in declaring it threatened or endangered if that, like planting milkweed, is just a feel-good action unlikely to translate into any benefit to the species." As for the meeting at UC Davis on Feb. 28, "its first order of business," Shapiro believes, "should be to decide what we need to know that we don't know in order to take meaningful action on the monarch (and by extension, to help the rest of our imperiled butterfly fauna)."